The area of concern is east of Union Gap, east of Thorp Road – an area also known as Anderson Quarry. A section of Thorp Road has been closed as a precaution and Yakima County Emergency Management has urged some homeowners to evacuate. One possibility is a quarry at the base of the hill. 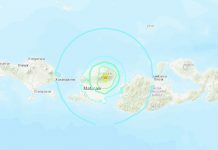 Geologists and emergency managers are trying to learn more about its impacts. 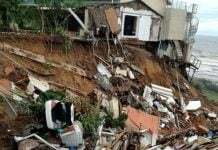 A classic way to destabilize a slope is to undermine the toe of that slope, and sometimes a little bit of undermining can cause a cascade that causes a much larger failure. And what about rain or an erthquake? 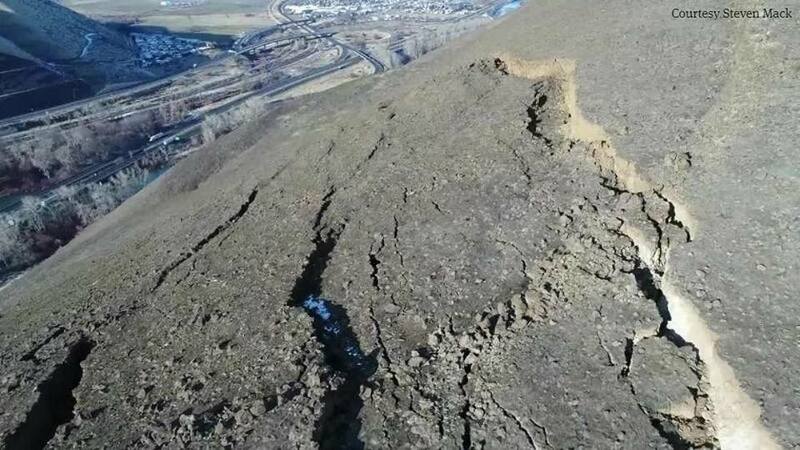 Giant crack in Yakima County, Washington State, threatens homes and Interstate 82 since October 2017. Meanwhile, the state is monitoring the hillside’s movement with GPS and a laser and large shipping containers have been placed at the base of the hill to block boulders and other debris from reaching I-82. 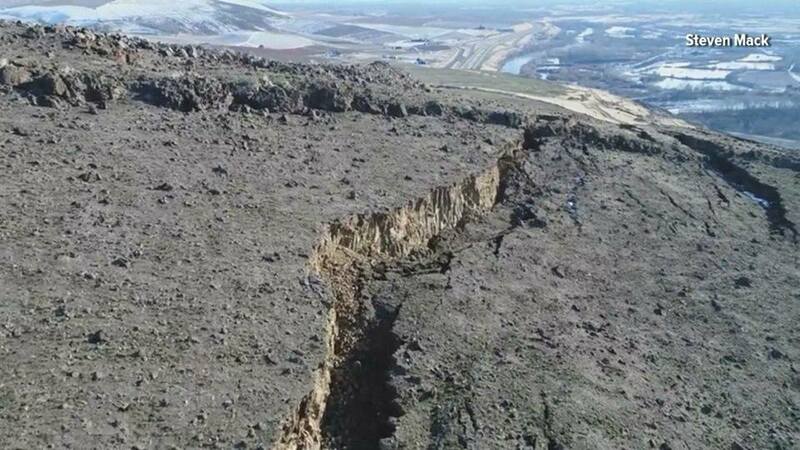 The huge fissure could lead to a dramatic landslide that could bury the Interstate. 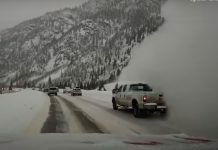 One possible outcome is that all this earth just slumps onto itself and stops, but emergency managers are taking this very seriously, making sure they can quickly close roads and get more people away if they see this movement accelerating. The question is how much of the slope will go and how fast will it go. There’s a high probability that the slide will keep moving. This is a big slide. It’s started to move. It’s been accelerating since October, but there’s a very low probability in all likelihood that it would move so far as to reach the highway. Quarry means reptilian underground base. Security guy who worked in the infamous alien base in Dulce, New Mexico mentioned that quarries are the entrances of reptilian secret underground bases. It makes sense. By digging deep and long underground bases, so much dirt and rocks are coming out and being disposed. Quarry can solve those problem to transport big quantity of dirt from under ground efficiently. Yes, a quarry is the surface facilities of reptilian secret underground bases. Then this huge crack appeared and ripped the Anderson Quarry in half. Of course, this is the attack by Galactic Federation of Light that have been cleaning up so many secret reptilian bases since 2011. The surname, Anderson is the typical reptilian Jew name around the state of Washington. The location of the quarry (=reptilian secret underground base) is “Rattlesnake Ridge”? Reptilians love to use rattlesnake to show their existence. I live next to Rattlesnake Saloon in Tuscumbia AL. Of course, Rattlesnake Saloon = Reptilian Saloon. They have huge caves around saloon. Again, caves and mines are parts of reptilian secret underground bases. Look at the Gadsden Flag with a rattlesnake saying “Don’t tread on me”. Those flag holders are, of course, all reptilians. Go to Google map around Yakima, Washington. Then search “military bases”. Around highway 82, you can find so many military bases and training center. That means there is a huge reptilian secret underground bases around Yakima. Those military is protecting the reptilian bases. Military organization = Reptilian organization is the correct description.